Cai was born in 1982 in Yang Jiang city, Guangdong province. He studied art at the Zhao Qing Institute in Guangdong. 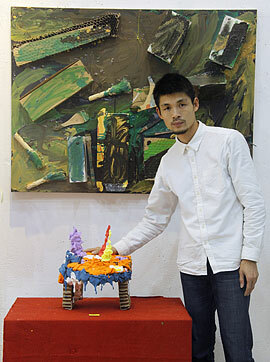 Cai was graduated in 2008 and became a professional artist. In 2011, Cai had the opportunity to learn the art of abstract painting from the legendary abstract painting master Zheng Kai in Guangzhou. Cai believes contemporary art should be close to the nature, to the people and to the society. Any forms of art that cannot reflect the present situation and arouse people’s curiosity are not qualified to be called contemporary art.